Hi there blog land! Luke is turning 2 on Saturday …. so it has been that long since I have written on the blog, yikes! If any of you have followed me on Instagram, you have seen what our little family has been up to. Cannot believe this was 2 years ago! I went back and forth about whether to start writing again. The moments when I’ve had the luxury of having some time on my hands, the idea of starting the blog back up has always popped in my head. I said to myself so many times… “I need to schedule some time for my blog, I miss it!”. But alas, it never happened. Some weeks were so hectic I would think, “There is no way I would have time to blog with everything that's going on.” I give serious props to all the other mom bloggers that I follow that write amazing blogs while keeping up with their kiddos. You ladies rock. I’m so excited to get back on the blog bus! I will need to catch y’all up on all the fun and adventure we’ve had these past 2 years. I won’t drown you with a ginormous (as Wyatt loves to say) post with everything from the past couple years. I’ll be posting a few updates this week. Since I didn’t post anything about Luke’s birth after writing about my pregnancy, let’s start it up! Luke was born on November 18, 2015 at exactly 8:00 am on the dot. 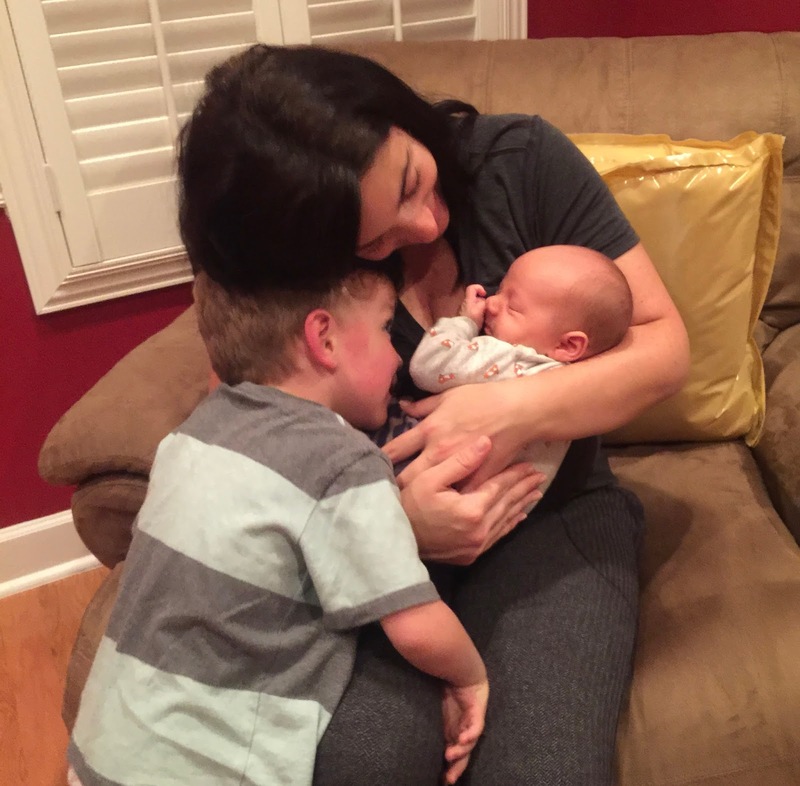 Since I had a planned c-section this time around, the delivery actually went pretty smoothly! The hospital recovery part was a little more difficult. I had some latching issues with Luke (just like Wyatt), and some major pains from the c-section and gas pains that come with it. They were going to let me go home after 3 nights, but the pain was so bad I wanted to stay the full 4 nights. I just didn’t want to go home to Wyatt being in pain that was that bad. Luckily after the 4th night I felt so much better. Life with two definitely took some getting used to! Nursing takes a lot of time, and 2 year olds are not down with that unfortunately. If Wyatt wasn't content with his toys, the iPad came in very handy. Even taking a baby and a toddler anywhere was an adventure to say the least. I remember having to plan out my whole evening way in advance… feeding Luke, then Wyatt, bathing Wyatt, where to put Luke when I was bathing Wyatt, then putting Luke down and Wyatt down. So friggin hard! On top of that, of course, the sleepless nights with a newborn were hectic. Then you have a 2 year old that is ready to play at 6am. Oh the humanity! But Luke completes our family and that couldn't make me happier. He is so sweet, calm and a little jokester... our little ray of sunshine. We had tears, laughs and lots of love those few months as a family of four in Tallahassee. Then we decided to make a big move… off to North Carolina. More about that next week! Luke got to be such a little chunker!